Raiden probably had the most difficult evolution in the Metal Gear mythos, and that completely stemmed from the fact that he got so much hate for being the main character for most of Metal Gear Solid 2, which in general was a game that got a lot more hate than it deserved. Then of course, Kojima Hideo, forever the troll, brought Raiden back as a badass ninja in Metal Gear Solid 4…and kept him as an NPC. Ninja Raiden finally got his own game in the form of Metal Gear Rising: Revengeance. After a few years have passed since Liquid Ocelot’s attempted insurrection, and Raiden has now tried living a normal life as a private military contractor. Things have been going well until another PMC, in an effort to start another war, assassinate the African president Raiden was protecting and cripple him in a humiliating defeat. Raiden comes back with a brand new cyborg body and a desire for revenge and vengeance (hence revengeance). Right off the bat, you should know MGR’s story has nowhere near the complexity of any Metal Gear Solid game. It’s stupid and knows it. Raiden barely has a character arc. Since the story is barely relevant, it’s the gameplay we should be talking about. Metal Gear Rising started off as a project called Metal Gear Solid: Rising. Kojima really wanted to make a proper sword-fighting game, but Konami didn’t know how to do it. I saw gameplay footage of Metal Gear Online, the online component of Metal Gear Solid 4, and I saw players very clumsily try to use the blade as Raiden and get wasted by characters like Snake, whom the entire gameplay was designed around. Enter Platinum Games. Angry Joe, in his YouTube review of this game, brought up a very good point in that most swordplay games tend to give you a feel that’s more akin to beating enemies up with a blunt stick that happens to look like a sword; you never feel like you’re actually cutting something. Here, however, you can see Raiden really slice and dice whatever is in his way, and that becomes all the more apparent in Blade Mode. In Blade Mode, you can slow down time, manually aim your sword and slice, or you can slash open a sweet spot of your enemy and grab his innards (which replenish your health and Blade Mode fuel gauge) for a Zandatsu kill. Overall, the control is like that of most traditional sword-based action games, where Raiden can do weak or strong attacks, jump, and perform context sensitive actions, such as the aforementioned Zandatsu kills. In addition, Raiden has a Ninja Run ability that allows him to run quickly, automatically deflect bullets with his sword, and hop over obstacles. There is one problem I had with the control scheme: a lack of a dedicated block button. In order to parry, you’re supposed to flick the control stick in the direction of an incoming attack and hold the light attack button. It’s context-sensitive. I had a hard time because I had a hard time getting Raiden facing the right way to block an attack, and timing hitting the light attack button. It was a lot harder in most enemy encounters because there is so much going on at a time. For that reason, I generally took a lot more damage than I should have, which in turn lead to a lot of frustrating deaths for me. I suspect such a control scheme came up as a result of having run out of buttons on the controller to map functions to; if I could give Platinum Games a suggestion, I would replace the Lock-On button with blocking. Lock-On was a completely useless feature, and having blocking mapped to a shoulder button would have felt natural to me. What was kind of awkward was the stealth sections that cropped up on occasion. As impossible it is to believe, but this is a Metal Gear game where the stealth was very poorly implemented, and that is because Raiden got around with about as much grace as a Jaeger from Pacific Rim. He wasn’t exactly Solid Snake or even his former self when it came to keeping himself hidden. It never took long for all the enemies to know where I am (complete with the traditional Metal Gear red exclamation point and sound effect! ), and it would lead to an inevitable fight, which is what Metal Gear Rising is all about. 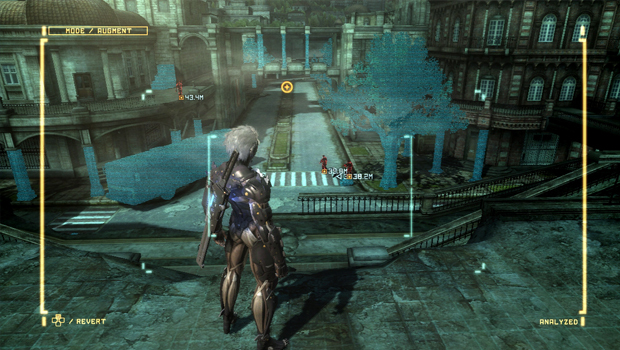 Metal Gear Rising has fun fights, but the level design leaves a bit to be desired. For the most part, the environments tended to be bland, linear sets. I suspect the levels got the short end of the stick in that the developers dedicated most of their time (and what the PS3’s and Xbox360’s hardware could handle) in Raiden, his enemies, and the fighting. Where Metal Gear Rising really shined in my opinion was in the boss battles. While the bosses themselves had next to no character development, the battles were extremely memorable. I do think the game stumbled by making Mistral, your first boss encounter, the most memorable one in the game. Overall, depending on your skill you can probably get through this game in about 6 hours on the Normal difficulty setting. While there are VR missions and an whole slew of unlockables for added replayability, I suspect you might be best off renting this game or waiting until now when the price came down to buy it; I bought it back in February when it was still a new release. Overall, mainly because of how well the slash mechanics were implemented, Metal Gear Rising: Revengeance definitely makes it into the “good game” tier in my book. Unfortunately, it had enough flaws, like the parry mechanic and the awkward stealth sections, to keep it a good game instead of a great one.